Nehru maama Rojava vachurundhaaraa? That is one common joke that we used to crack when we were in school. I don't know if today's school kids also crack similar jokes. Today's children may have upgraded their jokes to some newer version. In Tamilnadu we see Nehru as Maama; but in North India people call him chithappa (chacha). I don't understand how this confusion happened. The rift between north and south is going on for ages. When I was in college, I decided to bunk classes once and told my professor that my maama ponnu ( Uncle's daughter) died. My professor immediately asked me to go home. Little did he know that it was October 31st and I was referring to Indira Gandhi. I ended up watching a movie in a theater. Now when I am trying to figure out if Nehru is my maamaa or chithappa, I still could not arrive at a conclusion. The answer will tell me if she is my mora ponnu or my cousin sister. The funny thing about this father daughter combination is the fact that they wrote letters to each other; awarded themselves with Bharath Ratnas in 1955 and 1971 respectively. Yes; you read it right. They awarded themselves with the highest civilian award in the country. If this had happened today, social media would have gone mad and Arnab Gowsami would have cried foul on Prime Time Television. Their act only reminds me of those who like their own pictures and posts on FaceBook. 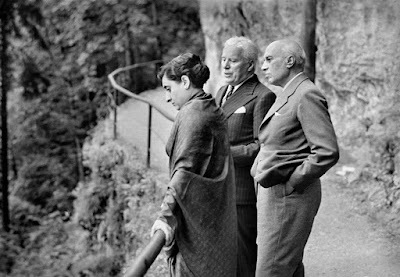 Infact there were jokes during my school days that India got its independence when Mountbatten decided to run back to England along with his wife because he was scared of Nehru Maamaa and his romeo skills. That is how engrossed we were with Indian history. We had zeros subject knowledge about Mughal history and Indian history; but indha maadhiri matter ellathulayum naanga appovey PhD. But one sad thing that I am not able to digest today is that the one waist coat that was always synonymous with Nehru is now relabeled as Modi coat. This is why I believe that varalaaru is romba mukkiyam or else we will be calling Nadhuram Godse as the father of Dineshan in the future. The following picture of Nehru and Indira Gandhi is my favorite because Charlie Chaplin is in it. People like him inspire me a lot because they always spread smiles on our faces. BTW, belated Children's day wishes to all the children out there; that includes 50 year old aunties too. Can someone tell me "Nehru maamaava? chithappavaa?